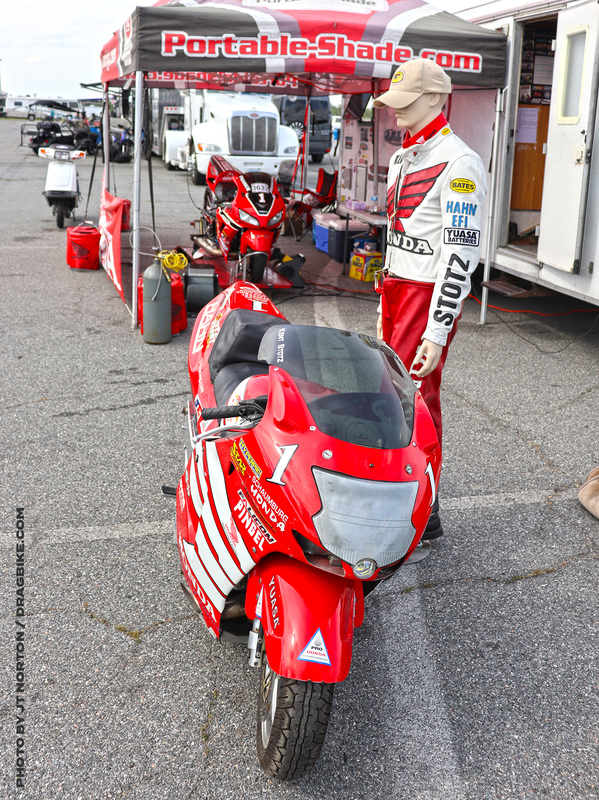 The Stotz Racing 2019 season kicked off at the Man Cup season opener event at SGMP in Adel, GA. This was the same track where we finished the 2018 Man Cup season by setting a new national record and winning two big races in one weekend. We were eager to start right where we finished off, but it’s never that easy. Off the trailer, we ran a smooth A to B pass. After that, we developed a spinning issue about five feet out from the starting line chasing the problem into Saturday’s qualifying rounds. Unfortunately, Mother Nature had other plans. Raining all day Friday we had just three passes on Saturday to get it right for Sunday’s eliminations. Changing out the clutch basket and rear tire, we seemed to have solved the tire spin problem. 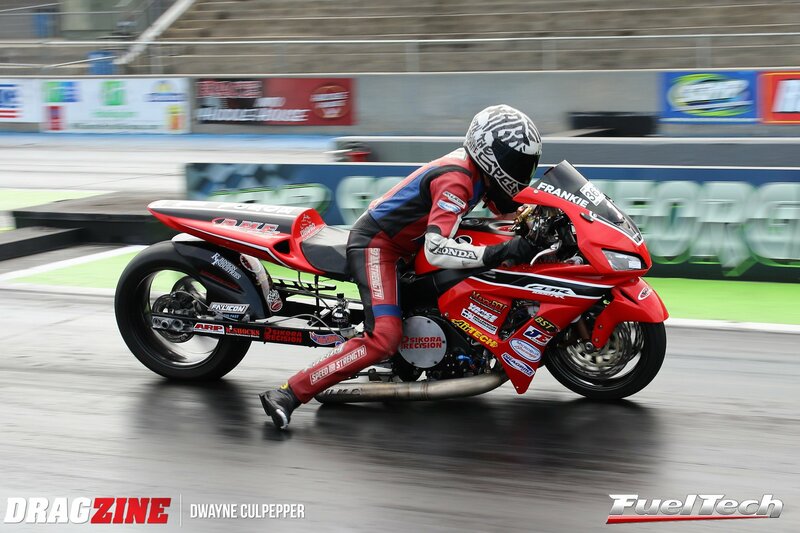 Qualifying number two with a 6.78 behind DME teammate Jeremy Teasley who ran a 6.64 at 219mph on the brand new DME/Connelly GSX-R1000 turbo. Jeremy and Frankie are great friends off the track, so they decided to line up on the track with each other for the third qualifier Saturday night. They were both shooting for that first 6.50 pass. Both had too much power in it and both ended up spinning. So the hunt for that first 6.5x is still on. Sunday’s first round of eliminations, Frankie went a stellar 6.66 at 186mph but was down on mph because we ended up hurting a head gasket. 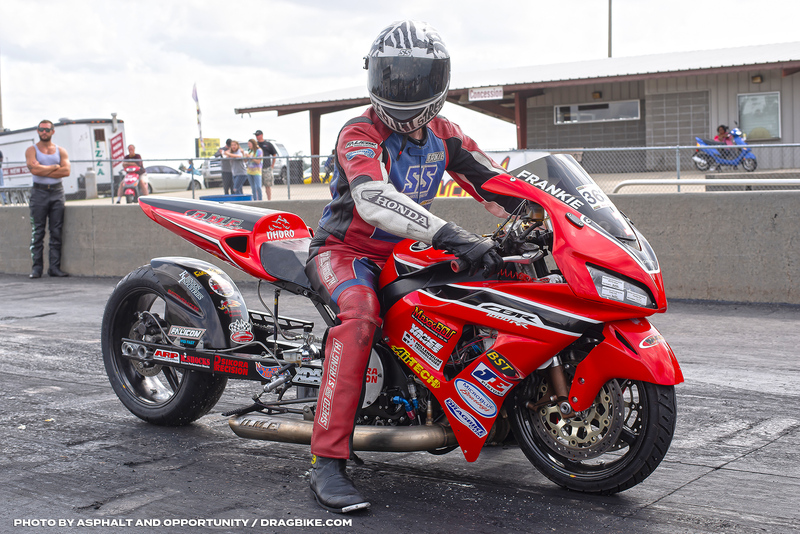 Kent and Frankie thrashed between rounds with help from the DME Racing boys and swapped out the hurt motor with a new bullet just in time for the second round of eliminations. Luckily Frankie had an earned bye run for the second round, so we decided to break the beams under power, and head back to the pits to make sure everything was right on the bike. 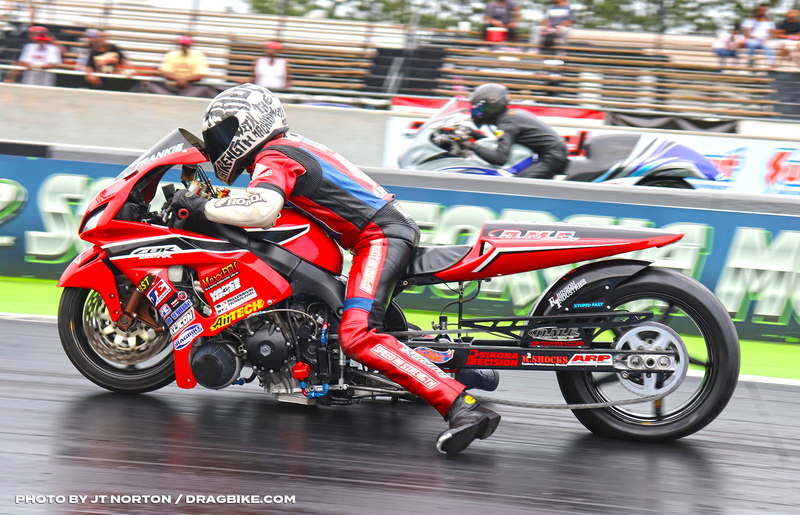 In the semifinals, Frankie was out on his opponent when the bike would not shift into high gear, to lose the race by two-hundredths of a second. Not the way we thought this race would end. But that’s racing. The team is heading back to Chicago to tear the motors apart and rebuild them with the new Vance and Hines heads and new Web Cams in search of more horsepower and MPH! You can see us in competition again in two weeks at the XDA Season Opener at Maryland International Raceway on April 26-28th. We also had a piece of Pro Street history on display at the Man Cup event. The National Motorcycle Museum in Anamosa, Iowa has had the 2001-02 Championship Honda Blackbird on display in their Drag Racing section since their new facility opened in 2006. Bill Hahn Jr. of Hahn Racecraft (Kent’s partner in1994-2003) opened his new Daytona Beach storefront, and will now have the Blackbird on display there through next years Daytona Beach Bike Week. Stotz Racing, five-time Pro Street Champions, first 200mph record holder, first turbo Pro Street in the sixes, and world’s quickest Pro Street, thank American Honda, prohondaoils.com, Dyno Dynamics, Sikora Precision, DME Racing, Al Lamb’s Honda, Falicon Crankshaft Components, BST Wheels by Brock, Robinson Industries, DC V-Twin, JE Pistons, MicroBlue Racing, Air-Tech Streamlining, M2 Shocks, Worldwide Bearings, ARP, Win Racing, Millenium Technologies, mobiledynamometer.com, and the newest Maxxecu.com.